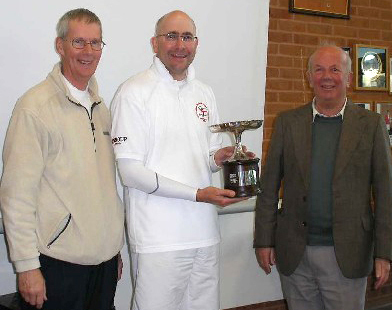 The 8th Lancashire International Open Golf Tournament was hosted by Bury CC on April 12-13 at Heaton Park. Twenty contenders spent the Saturday in two blocks of ten, in a format giving each 8 games. Block A was won by Ian lines with seven wins, Brian Storey and John Moore winning six and the fourth qualifier on who-beat-who from a three-way tie on five being Freda Vitty. In Block B four six-game winners were similarly put into the sequence Chris Sheen, Samantha Curry, David Openshaw and Tim King. This meant that in the KO phase on Sunday Ian and Tim met in a quarter-final. Overnight weather had delayed the start so they were put on the first playable lawn, 50 yards from the pavilion, so the disappointed crowd had a poor view. The other three lawns trickled in later, so the average time loss was about an hour. The weather then cleared and progress was steady, the final fittingly being the last game to finish ( just before six) with Tim beating Chris 6-7 7-4 7-4. The 12 non-qualifiers played a round robin of doubles won by Dave Turner and Fergus Thompson.